Zachary Nislick ’19 dressing appropriately for the winter. Photo by Andrew Wojtowicz. Winter term hit Union full force this week, with temperatures dipping as low as negative seven degrees Fahrenheit at points throughout the week, and the campus receiving over 15 inches of snow. Periods of freezing rain rendered parts of campus impassable on some nights, making traveling around campus more difficult this week. While most students prepared for the weather by breaking out their Canada Goose jackets, beanies, gloves and Bean Boots, one courageous first-year student was not to be deterred. 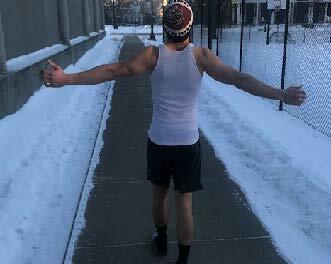 Davidson resident Jack Wassington ’22 was spotted wearing nothing but an AND1 T-shirt, Puma athletic shorts and sneakers on Tuesday morning as the temperature fluttered around zero degrees Fahrenheit. Realizing I was not dealing with an ordinary first-year, I then asked if he felt that his brand new Nike Huaraches were able to provide enough grip on the ice around campus. In response, Jack scoffed, buried his hands in his pockets, and walked up campus, nearly slipping on the stairs by Davidson. During the entirety of our interview, people stared in a clear sign of respect – possibly even a sign of attraction at our heroic freshman. Realizing that I had just encountered the toughest first-year at Union, I stared in awe as he walked away, nearly frozen from his lack of clothes. Later that day, I saw Jack walking home with a girl in each arm, clearly enamored with his red, wind-burned face and lack of feeling in his extremities. Throughout the week, as the weather stayed frigid and the campus remained slick with ice, I realized a growth in the number of stoic first-year men shedding their layers in a show of willpower. The sheer bravado came to a head on Friday when a group of first-years were last seen heading home from Frat Row wearing nothing but sandals, shorts and wife beaters, surrounded by three girls each. Reports coming in are stating that crowds of hundreds of Union females headed to Davidson to see the utter display of male dominance. RA and Biology major Ed Jackson ’20 described the event as “not unlike the mating rituals of primitive animals” he had studied over the summer. “It’s extremely strange to watch,” Ed commented. “It’s like they’re all competing for lowest body temperature at the end of the day. This is what happens when mommy isn’t around to dress you anymore.” In other news around campus, Wicker Wellness Center confirmed in an email to students that they would remain closed on the weekends, so just “try not to get too sick” until the weekdays.